Remember the date: November 15th. Marc Jacobs is revisiting the iconic Perry Ellis collection that got him fired and the show that made his career. In 1992, Marc Jacobs was fired from his role as creative director of Perry Ellis, shortly after the release of his grunge SS93 collection; inspired by the personal style of his friends and the music style of the time. It was the 1990s - Kurt Cobain and Courtney Love were the couple dominating both the tabloids and MTV. The collection was the epitome of everything happening: Dr. Martens paired with floral granny dresses, beanies and plaid. The collection was darkly romantic, aloof and subversive. In a time where Kate Moss was ruling the runway, with the likes of Corinne Day and David Sims behind the lens, wearing slip dresses with Docs was being a part of the cool kids club. The new wave of fashion photography and the alternative music scene was the inspiration behind the collection and it embodied all of what the 90s was about: "authenticity, acceptance, freedom, tolerance..."
The show soon became the most talked about moment of Marc Jacobs' career, and not because of the positive feedback. 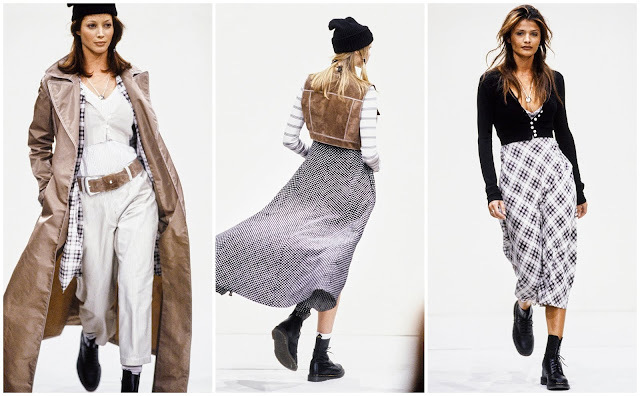 Critic, Suzy Menkes claimed that "grunge was ghastly" and The New York Times described the collection as consisting of "$12 flannel shirts as the inspiration for $300 designer ones." The sequence of grunge-themed looks was such a harsh difference to the preppy style that Perry Ellis was known for, that the negative reviews ultimately led to Jacobs' very public dismissal. "GRUNGE IS AN ANTHEMA TO FASHION." Despite the negativity, Marc Jacobs claimed that the show is what put him on the map as a designer and it now serves as one of the standout moments of his career. Now, the collection is remembered as being a turning point in fashion and in spite of the controversy caused at the time, critics have changed their minds and even Perry Ellis congratulates Marc Jacobs on reissuing the "first of its kind collection that changed the direction of contemporary womenswear." "WHY DID SO MANY CRITICS ALLOW NO ROOM ON THE AMERICAN RUNWAYS FOR A LOOK LEGITAMATELY AN EXPRESSION OF IMPERTINENT NEW VALUES...?" 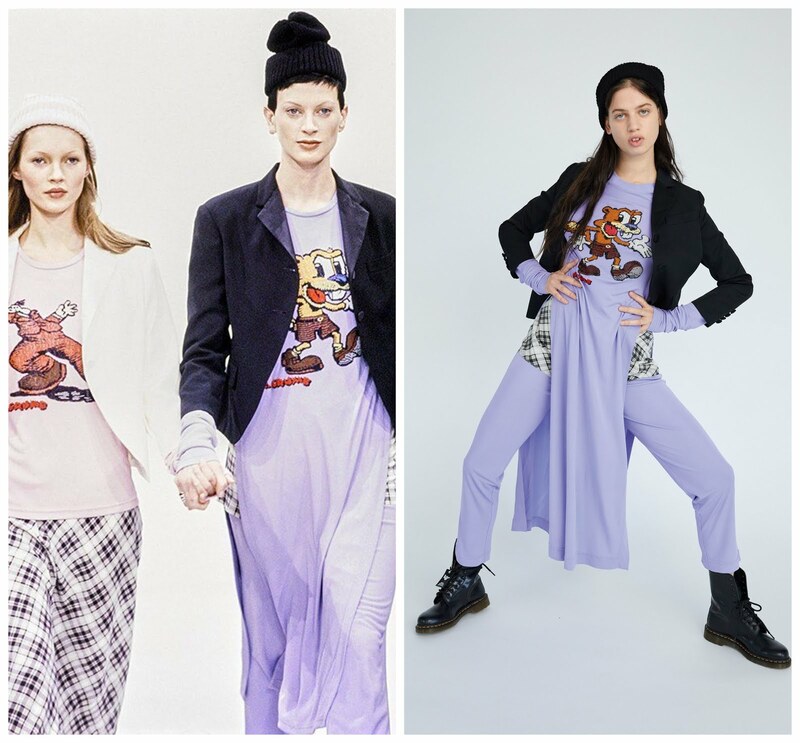 The Resort 2019 collection is a limited edition collaboration with Dr Martens and Robert Crumb. The 1460 boots are the iconic shoe that gives the same rebellious edge to any look now, just as it did in the 90s. The collaboration includes Redux Grunge branding and Marc Jacobs shoelaces. Illustrations from the famed cartoonist are tugging at our nostalgic heartstrings, printed on tote bags and t-shirts. The new collection features 26 of the original looks. 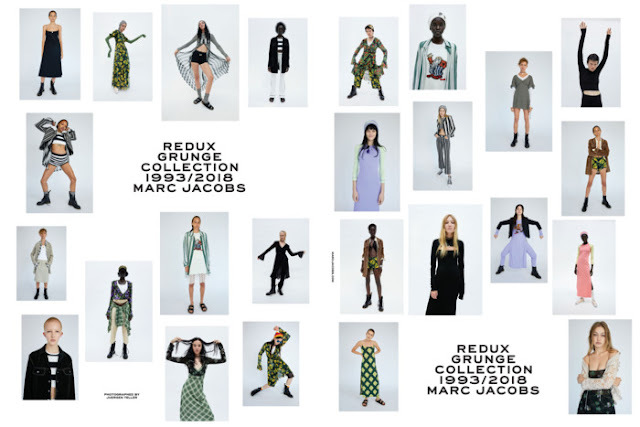 Partnering up with Juergen Teller, the campaign includes models such as Gigi Hadid, Coco Gordon Moore and Slick Woods wearing Birkenstocks with socks and sagging beanies. Paying homage to the original show, even more, is the fact that some models in 2018 are wearing the same clothes that their supermodel mums did in the 90s. On Instagram, @MarcJacobs wrote "To introduce #ReduxGrunge, @LillyMcMenamy is wearing the exact look her mom, Kristen McMenamy wore when she closed the original Grunge collection as the groom to Kate Moss' bride. Lily brings her own character, energy and spirit to the same look 25 years later." The collection is available to pre-order and will be released worldwide on November 15th. View the lookbook here.